Star Tribune, a local Minnesota newspaper, sued to unseal the divorce records of Rep. Keith Ellison (D., Minn.), the Democratic candidate for state attorney general. The divorce records between Ellison and his ex-wife, Kim Ellison, were sealed in 2012 and have become of public interest as Ellison faces an allegation he abused an ex-girlfriend. 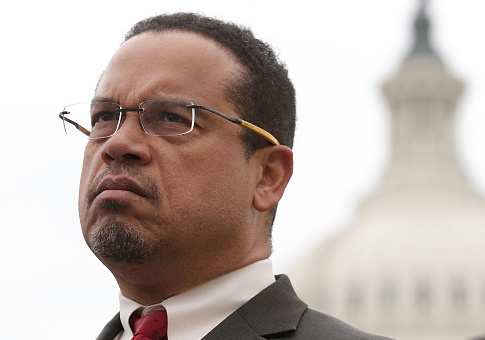 Ellison’s ex-girlfriend Karen Monahan accused the congressman of hurling insults at her and dragging her out of bed. She claimed the incident occurred in 2016 after Ellison told her to take out the trash. Ellison, who also serves as the Democratic National Committee deputy chairman, denied the accusations as "not true" and said the independent investigation into them will prove Monahan's claims are false. Ellison's ex-wife has come out in support of Ellison, saying he "never abused me in any way before, during, or after our marriage." Ellison and his ex-wife have filed a joint opposition to the Tribune‘s push to unseal the divorce records. The Ellison campaign released a statement from Kim Ellison. "Our divorce simply isn't the public's business, and therefore, when we separated, we jointly asked the court to seal the file. Now, one month before a closely contested election for Minnesota Attorney General, a conservative group wants to probe our divorce file in search of something to use against Keith in this race. I am disappointed that the Star Tribune would choose to file this motion," the statement said. A Hennepin County District Judge will decide whether to unseal the divorce records. During last Friday's debate, Ellison was asked if more accusers would come forward with allegations against him. He responded by saying he has no idea what allegations others would "cook up." "Look, in this political environment, I don’t know what somebody might cook up," Ellison replied. "But I could tell you that there is absolutely nobody that I am aware of who has any sort of—who is threatening or suggesting or who has ever made a prior accusation about me." This entry was posted in Politics and tagged Keith Ellison, Minnesota. Bookmark the permalink.